Snow? 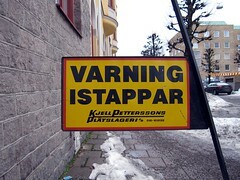 We have plenty of that here in Sweden at the moment. Words for snow? Swedish has one or two of those as well. Of course, this is an opportunity to talk about linguistic relativity, the idea that differences in languages parallel (or even determine) the way speakers of those languages think. This is also known as the Sapir-Whorf hypothesis, although neither Edward Sapir (1884-1939) nor his student Benjamin Lee Whorf (1897-1941) actually formulated the hypothesis. One offspring of linguistic relativity is the story that Eskimos have many words for snow, therefore Eskimos conceptualise snow differently than do speakers of other languages. As it turns out, Eskimos really don’t have that many words for snow – see the Wikipedia article as well as Geoff Pullum’s writings on the subject (referenced in Wikipedia). However, Swedish has some interesting words for snow, so let’s test the hypothesis. 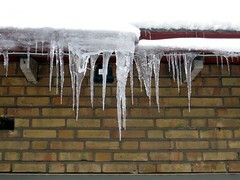 The word skare refers to snow crust, that is, where the surface of the snow has melted and then refrozen. See, the concept is simple enough, but Swedish has a specific word for snow crust, whereas I’d just use the English word crust. For other sorts of crust, the Swedish word is skorpa. My favourite snow word is dagsmeja (or maybe dagmeja if you’re from south-western Sweden). From dag, day, plus mäghin, an Old Swedish word for power, it is snow which is melting on a sunny day even though the temperature is below freezing (if the temperature is above freezing, it’s tö, thaw). I don’t know of any comparable English word, but I know what the stuff is and can describe it well enough in English. I don’t think any of the concepts inherent in words like skare and dagsmeja are difficult to grasp, and now if I tell you I’m looking forward to tö, but am having to make do with dagsmeja, you know exactly what I mean, even if English “doesn’t have words for it”.